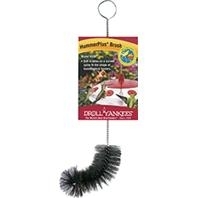 Hummerplus™ Cleaning Brush for Nectar Feeders & More! This 9 Inch, curved brush design cleans the interior curves of hummingbird feeders, or bowl feeders. Also effectively cleans the ports on tubular feeders. The soft, flexible bristles will not scratch plastic either.